Its been a good summer so far, but I have not had much time to do many landscapes. I have had more demand to do events and portrait photography, so my first love has been a little bit on the back burner. But this week, while waiting for my daughter who was at a #Hillsong Youth Leadership meeting, I decided to sneak my camera into the boot of the car, as it did not make sense to take her there and come home and pick her up again. So I spent 2 hrs taking pictures of the #RiverThames from Putney Bridge, and this was the best of the images. For a change I did not take a wide angled lense with me, I used a Nikon 50mm F1.8 for this picture and I have to say I was quite pleased with it. As a Landscape photographer you get very attached to your "wide angled lenses" because you can get more into the image, but sometimes less works just as well. The colours captured in this image, are very close to what could be seen with the naked eye as the sun hid behind the clouds in the closing moments of the day. This image in an interpretation of what I was feeling when I took it; simply "This Feels Like Summer". As the summer rolls on and I have some time on my hands for recreation, I will be posting mores of Landscapes for you to enjoy. I hope you enjoy this one.! Je Suis Charlie 2015..Really, OMG! In January 2015 the world was shocked by the attack on 'Charlie Hebdo' in Paris, I cannot believe its been 2 years since this event happened. I remember being glued to the news watching the footage as members of the public were being shot by gunmen walking the streets of Paris killing indiscriminately. So many cities around the world came out in support of Paris, and London was no exception. There were a few buildings and monuments that were lit in the colours of 'The Tricolore', but I was only able to get this shot of the lights on Tower Bridge. The mood around this historical site was subdued and reflective as people stood and simply observed the bridge in silence, as the colours transitioned in a simple light display that was befitting of such an occasion. Understated and respectful! This post, is just a short reminder to myself and also possibly to the readers, that we live in a troubled world. The UK has voted for Brexit, the USA has voted Donald Trump in as the 45th President of the United States of America. Mexico is refusing to pay for the wall and much much more, is taking place in our troubled world. But these troubles are not new; at the age of somewhere between 9-10years old the unity of my school class was suddenly driven into turmoil, because the realisation that we came from different races and cultures suddenly dawned on us all. Prior to that we had not really considered our differences. Children of Chinese, English, Caribbean and Nigerian decent who had previously enjoyed football together in the playground, suddenly distilled into racial groups, and started taunting and in some cases fighting, for no reason at all. Then our fantastic form teacher 'Mr Peter Charles Talent' intervened in our next form lesson and first started by listening to our complaints; and when all was said and done he concluded the matter with one simple sentence. "In this world there are only two types of people you will need to learn to understand in detail, and that is men and women; if you can do this, their colour or cultural heritage will not be of any great consequence or concern to you, but the stories of their lives will enrich yours"
Even though the events surrounding 'Charlie Hebdo' may not fall neatly into this simplistic ideology, there is a lot that could be made better if we simply 'listened to men and women and empathsized with their plight'; as Ghandi said "An eye for eye will only make the whole world blind". To the families that lost loves on that day, whether because of the weapon of the pen or because of a weapon more lethal, lets LISTEN and REMEMBER the events of January 2015! For the month of March 2017, 'Hever At Sunset' will be sold at a 30% discount. Get your Canvas, Aluminium or Acrylic, fine art photography piece for your office, boardroom or home. Don't forget to use your DISCOUNT CODE: HEVER032017.....Click the Image to get to the shop. For the month of March 2017, 'Boat On Shore' will be sold at a 30% discount. Get your Canvas, Aluminium or Acrylic, fine art photography piece for your office, boardroom or home. Don't forget to use your DISCOUNT CODE: BOAT032017..........Click The Image to get to the shop. Good Afternoon Everyone, there has been an overwhelming response and demand to my post about the first 2 canvas products going to customers. In this short blog I am just uploading the picture(s) so you can see them a bit better. A number of people have requested pricing for the images, so before Wednesday of this week I will be putting them up on the website shop with a 30% discount code so keep an eye out for my post. This is a image taken at Dungeness Beach in Kent on a very cold autumn afternoon when I dragged Pearl and Amara (my wife & daughter) out for an adventure on the south coast. It was cold, windy and very exposed and my beloved didn't last very long and returned to the shelter of the car; but Amara and I stuck it out for about an hour. This was one of the last images I took that day and it was Amara's choice of boat. Well done missy!! If you have every been to Dungeness you will know it is a boat graveyard. In the distance on the horizon you will see many more boats that we did not get an opportunity to explore, we will be going back this year. This image could be called a number of things but the working title is 'Hever At Sunset'. Hever which is close to Edenbridge is a wonderful area for landscape photography with castles, royal grounds and gardens, with a beautiful lake which I call a private sea. This picture was taken on the Hever Castle Golf Course, after a round of Golf. The sun was going down and the course was starting to empty so I thought a 1 hour power walk with camera in hand would do the trick. I am pleased with this image because of the light, and also because this shot is hand held. I will be offering these two images from the shop at 30% discount by Wednesday 1 March 2017. So keep your eyes peeled for my FaceBook post and other social media announcements. Once again thank you all for your encouragement it is greatly appreciated. History is such strange bed fellow! For hundreds of years 'Traitors Gate' was somewhere to be feared, because if you entered there you were very unlikely to ever emerge alive again; but in 2017 tourists from all over the world come to visit the 'Tower of London' a castle and palace in the centre of London, and part of the attraction is 'Traitors Gate'. One of the most disturbing stories of the Tower of London occurred in the mid to late 1400's when Edward V, who was 12 years old when his father died, was imprisoned with his younger brother in the Tower by their Uncle the Duke of Gloucester. The Duke had them declared illegitimate so that he could take the throne in 1483 and at some time not long after that the boys were killed. Its a story steeped in mystery, intrigue and down right skullduggery, but after all of this, the Duke of Gloucester whom became Richard lll died about 2-3 years later in the battle of Bosworth in a battle against Henry Tudor, so was it worth it? In more recent times the bones of Richard lll was discovered under a car park in Leicester, which were later exhumed. At the time, I have to say I was a bit taken a back that a King dies in battle and the victors just dumped his remains in a ditch. My earlier vision of Richard lll, was of the returning Crusader, a hero who helped Robin Hood Earl of Loxley restore order in middle England. I am not sure if that part of the story is historically accurate but hey I love a good story. However the story of the Princes in the Tower still raises a bit of a sour taste in my mouth and may have contributed to the way in which his remains were deposed of by the Tudors. Can't help but think, what goes around comes around! OMG, How on earth did we get to Richard lll??? This blog is supposed to be about to finding images and stories within images. This picture started off as an shot of the Tower of London taken from the south bank of the River Thames that captured the whole of the castle, but in post editing the words 'Entry To The Traitors Gate' just seemed to demand its own focussed image and story. When I started photography in 2013, one of the things I struggled with was a picture telling a story, in 2017 I am only just beginning to understand, that every picture has a story, we just need to find it. If you have taken images which you later aggressively cropped to get an image with a stronger story, please share it when you read this blog, I would be interested in hearing the stories behind your images? As always great to from you, and your comments are always welcome. Vienna is one of the most beautiful cities in Europe and it is well worth a visit if you have not been there. For the last six (6) year I have been to Vienna at least once a year to attend the European Congress of Radiology. In more recent years I have tried to get out in the evenings to take some night shots. This is a classic night shot with light trails across the road from the Rathaus which is the City Hall of Vienna. Built by Friedrich von Schmidt from 1872 to 1883, former foreman of the cathedral of Cologne, the building is fashioned in the neo-Gothic style. The buildings in Vienna are beautiful, providing a glimpse into a rich history that feels distinctly royal in many ways. The thing that always strikes me about the city is that the building are all similar heights which adds to the character of the place; no one building dominates, each consecutive building adds to the feeling of grandeur. It is my plan to return to Vienna specifically for photography not sure when. But when I do I will be adding to my portfolio of images from this great city. Keston Common has become one of my favourite playgrounds for photography; only a week ago I was shooting frosty leaves and frozen ponds. Today as I was finishing my shoot, I was set upon by a gaggle of geese, making the most noise and pruning themselves together in a waltz like dance. Even though I was freezing and making my way back to the car, I just had to stop and try and capture the moment. The light was not great, it was overcast and in the shade, quite dull, it was like having a huge light box and someone forget to turn it on. But some how the whites of their feathers shone through, contrasting with the bright coloured feathers of the ducks in the back ground. Once I brought the image into post editing, because the light was so flat a lot of the usual tricks of the trade just didn't seem to work, or make the composition pop. Also because this an impromptu passing shot, the head of the goose on the right wasn't sharp due to movement. So I thought lets try something different, lets turn this image into a painting. Now I had tried this before on a portrait of my son about this time last year, January 2016, and it tuned out OK, so nothing tried nothing gained, you have to be in it to win it. So above you have my effort, I have to say I am quite pleased with it considering it was not planed in anyway, it was just the moment. If you don't know me by now, you will get to! All comments and advice are welcome. As we snuggle up in our warm homes, outside in the frosty cold and bitter winds, there are some photography gems worth hunting for. This image is a classic example of don't look up, look down. I am learning, that it is especially important to look down during the winter months, because the landscape as a whole can be quite sparse and void of colour, and tone. But the stuff you are walking on, can often be more interesting; natures intricate carpet of living and dead things. This image was taken at Keston Common on the banks of one of the lakes there. I spent some time trying to create a composition of the frozen lake covered in debris and to be honest I was struggling. And just by chance, I looked down when changing lens and saw this micro world of ferns, spiders webs and frost. It was not easy to get the camera high enough on the tripod so the lens had enough distance to focus, but the effort was worth it. The light on the day was actually much warmer than this desaturated image, BUT I felt this draws the viewer into the image more without the colours distracting the viewer from the many hidden details in the image. The Image works in colour, but the colour contrast i think, draws the eye away from examining the details in the image. The most noticeable for me is the spiders web in the bottom left which is more apparent in the desaturated image. When I first saw this composition in the field it was the contrast in colour that drew me to it. I positioned the frame so that a diagonal ran from top left to bottom right along the colour gradient. But when I got into post processing the more I worked at the mage, the more the colour gradient bugged me. I have included both versions of the image in this blog post, and as always I welcome your comments, critiques and criticism. For me learning is my passion and my aim is to get better and better as a photographer. I can only achieve that with your opinions, so its open season, looking forward to hearing from you! You may totally disagree so do! Well as promised, I braved going out again today into the frosty wilderness. It was not as cold this morning because it was only -0.5c. But there was still lots of fun to be had. Below you will see an image that captures the 'Receding Frost', as the sun melts the frost from the tree and then it is slowly disappearing from the ground. It was a bit of a challenge finding an exposure that would capture the light falling on the tree and and also retain the soft texture of the distant clouds. If you you have comments, they are always welcome. In fact is this the type of picture you would buy for your home or office. I Am Truely A Warm Weather Being!!! You know with my Caribbean genes, 'I am truely a warm weather being'; however if I am going to be a Landscape photographer, I am going to need to put on my thermals and get out there when it is -1.5c and get shooting. Today went to Jubilee Park in Bromley Kent and it was wonderful just to wonder around and look for light and interesting things to photograph, whilst avoiding all of the inquisitive dogs, who kept coming close, to find out what this man was up to with a camera. Jubilee Park, has some light woodland as well as some wide open spaces, and because of this, there is very little continuity in the landscape that would make a great photograph. I think visiting when the sun is higher would work better for the woodlands areas, because you would get shots with the sun coming down through the trees almost vertically. If you thought going out in the frost to take pictures was my idea, think again. I was inspired by Thomas Heaton (@theatonphoto) in the video below; and I thought if he can do it without a hat, then I can have a go! So after being made to feel totally guilty sitting at my warm desk watching YouTube photography videos, I decided to wonder out to see what I could see. I have to say that I agree with #ThomasHeaton, when the weather is frosty, and the light is poor, you are forced to look at the smaller things, to create compositions from objects below shoulder height. To this end, I tried looking at leaves and the best of my efforts is the image below. Let me know what your thoughts are, I would be happy to hear your comments and thoughts? One Tuesday after a round of Golf I decided to venture out with my camera in hand to see what I could see in Edenbridge. I set myself a time limit of 2 hours, and restricted myself to 1 lens (24-70mm) and I was not going to use a tripod. The whole reason of the exercise was to push myself to take pictures intuitively, spotting compositions and capturing them and moving on. Setting an exposure I could hand hold and getting a good image. The rules of composition was I trying to use? As many as I could remember in the moment. Have you ever stood before a scene and started to try and remember all the rules of composition, Rule of Thirds, Leading Lines, Textures, Form, Tonal Contrast, Odd Numbers, Diagonals ... etc.... and then you come up with a complete blank? It has happened to me many, many times, but with practice it is getting easier. On this shoot the most important thing I wanted to find was light. The sun was just just beginning to set so this was a great time to start the experiment. This image is called 'Trees in a Field'. Here I am trying to use leading lines and the rule of thirds. 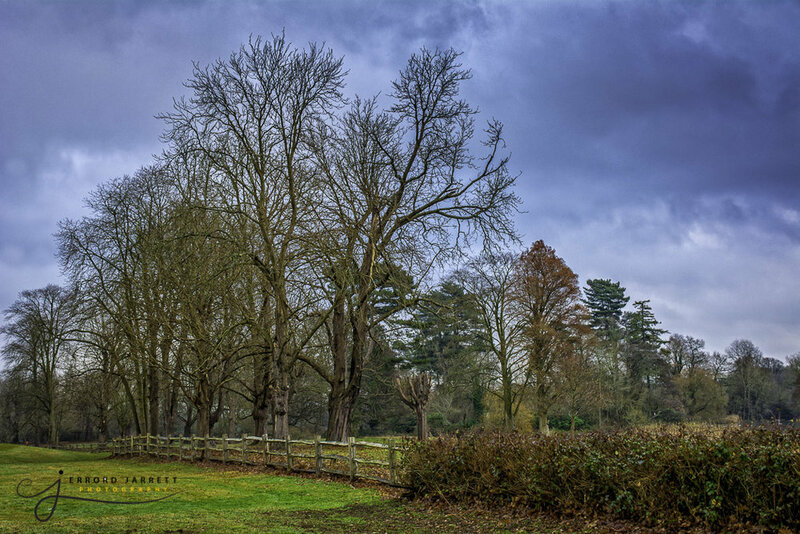 I am reasonably happy with the winter colours of the trees and the gathering storm I think gives a good colour contrast with warmer colours at the front and cooler colours in the sky. The exposure was a F10, 1/50sec ISO 200mm and a focal length of 29mm (D7100 and 24-70mm Nikkor f2.8). If you want to critique the images above, please do. If you are a photographer, interior designer or a member of the public, your comments are welcome. Which of the images do you prefer? Don't be precious, I am not! I just want to get better at photography and be a leading light. Charles Sterling Jarrett Photography is proud to be partnering with a number of Interior Designers later in 2017, the first of which is Cambridge Interior Designs (www.cambridgeinteriordesigns.com ), so periodically we will be posting blogs of our Fine Art Photography that has been hung in homes and offices by Interior Designers.